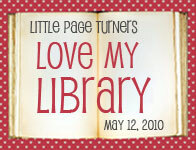 Today I am joining Little Page Turners' Love My Library party. 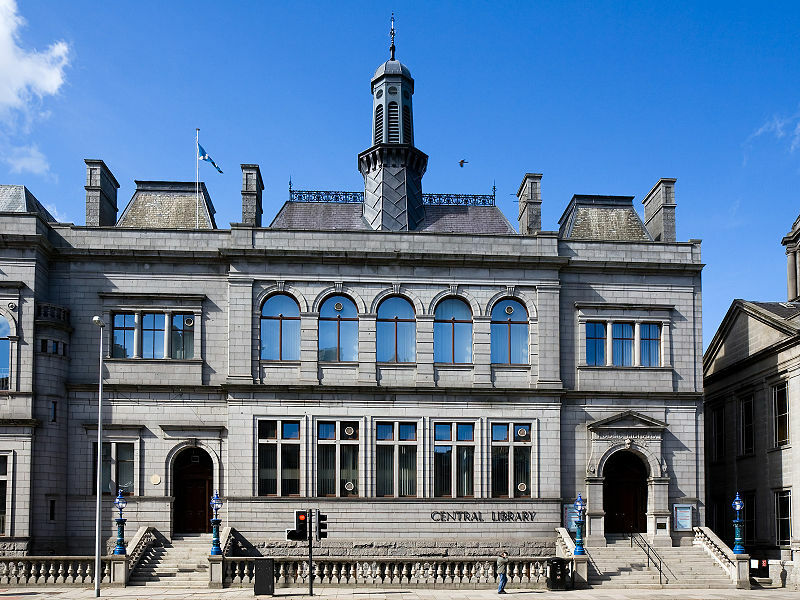 At this time in our lives, our library is the Aberdeen Central Library. 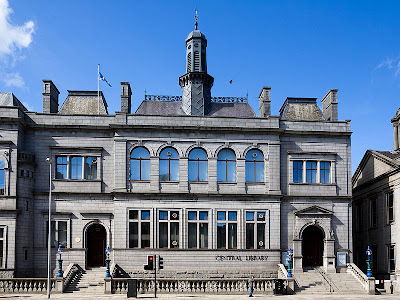 It is housed in the beautiful building that first opened in 1892. We always enter on the far left, using the ramp and lift (elevator). The children's library is located on the second floor (considered the third floor in the U.S.). As we step out of the lift (elevator) into the large room that contains the children's library, a welcoming site greets us! This colorful train has small benches and contains all the board book, for our littlest readers. To the right, behind the train, are the books for toddlers and primary school children. To the left are the teen books. As you might imagine, we spend most of our time in the toddler / preschool section. They have big bean bags to sit on, toys to play with, and a wonderful selection of picture books. I love that they have toys, games and other activities for the kids. Sometime we just sit at a table and color; or we pull out an game to play together. Abigail loves exploring the library. I love that this room is entirely enclosed, and safe for the kids to wander a little. The decor is so bright and colorful. This room has very high ceilings and huge windows. On the tops of book cases and the window sills they have stuffed animals, displays of various arts and craft projects from local school and any number of imagination-inspiring pictures. They house all the picture books in these great boxes, in roughly alphabetical (by author) order. These are the perfect size for little kids to access, and don't have the problems that shelves can sometimes happen with kids and bookshelves (picture all the books falling at once because someone was too enthusiastic about getting their book down... not that this has ever happened to us...). And I love that even my two year old is inspired to sit down, pull out a book and browse through it to see if she wants to take it home. Today was actually the first time she very carefully picked out her books after looking through several. Every library has wonderful things about it, and there are things I miss about the library in Princeton, but this library will always hold a special place in my heart. This is the library where my kids really learned to love books. This is the library that my kids (at least Joshua) will remember fondly as his library. They have some wonderful programs here, like Bookstart that sponsors the Rhymetime of story and songs each week. They also don't have late fees for books checked out on a children's card and kids get free movie rentals. The little neighborhood library near us also has toys and games the kids can check out. I still have very fond memories of the local library where I grew up. It's great that your kids of such a special space too. Wow what a great kids section. Glad to hear about all you guys are doing and that everything is going so well. I can't believe how much Abigail has changed too. We miss you guys. Take care. I love how the alphabet is on the wall above the books! What a great way to display children's books! You have a lovely library! what an amazing building! i love how they children's books are displayed in bins..wish they did that at our library! Oh, another library that I envy! The building is beautiful. I love how they have bins for the picture books. It's so much easier for little ones to see what they would like to choose. I love the child height book boxes and the cute chairs kids can sit on as they browse through books--such a clever idea.